Melt butter in small, heavy saucepan over low heat until milk solids settle to bottom of saucepan. Skim off any foam from top of melted butter. Carefully spoon golden liquid (clarified butter) from saucepan into another small saucepan; discard milk solids. To clarified butter in saucepan, add onion, seafood and fish seasoning, garlic powder and hot pepper sauce; blend well. Place scallops and shrimp in 12x8-inch (2-quart) glass baking dish. Pour butter mixture over scallops and shrimp; turn to coat. Let stand at room temperature for 30 minutes. Heat grill. When ready to grill, oil grill rack. Alternately thread 3 scallops and 2 shrimp onto each of six 12 to 14-inch metal skewers; reserve butter mixture. Place kabobs on gas grill over medium heat or on charcoal grill 4 to 6 inches from medium coals. Cook 6 to 10 minutes or until scallops turn opaque and shrimp turn pink, turning once and brushing frequently with butter mixture. If necessary, reheat butter mixture before brushing on kabobs. Bring any remaining butter mixture to a boil; serve with kabobs. To broil kabobs, oil broiler pan; place kabobs on oiled pan. 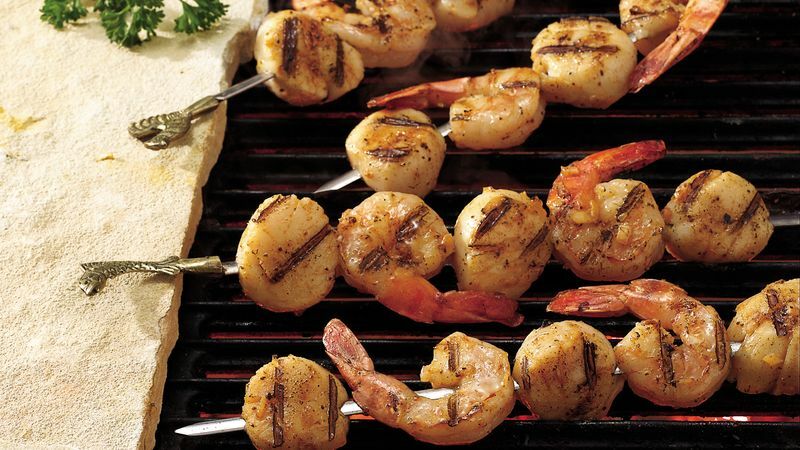 Broil 4 to 6 inches from heat for 5 to 8 minutes or until scallops turn opaque and shrimp turn pink, turning once and brushing frequently with butter mixture. If necessary, reheat butter mixture before brushing on kabobs. Bring any remaining butter mixture to a boil; serve with kabobs.